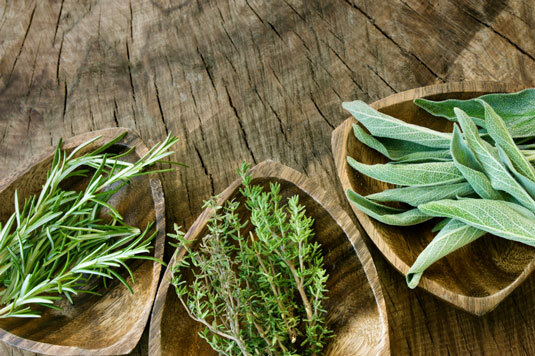 Give up salt in favor of herbs and spices. Most people eat too much salt. Just reducing the salt in your diet will help to bring down your blood pressure, but you may complain about the loss of flavor. The good news is, you can add herbs and spices and easily solve that problem. Sure, herbs and spices don’t taste exactly like salt, but your palette will be just as happy, and it won’t miss the salt at all. Here are several herbs and spices that will make you forget you ever needed a salt shaker (remove it from your table while you’re at it): parsley, sage, savory, cilantro, basil, and pepper. Besides the wonderful tastes that herbs and spices add to your food, they do so with the addition of virtually no calories. Grains (also called cereals) are the seeds of grasses that are cultivated for foods. They come in all sizes, from popcorn to teff, a grain that is so small that when it falls on the ground it’s lost. The parts of a grain include the germ, endosperm, and bran. Whole grains have all three parts. When grains are refined (milled) they lose the germ and the bran. Refining was developed to give grains a longer shelf life and better texture. White flour, for example, is all endosperm. 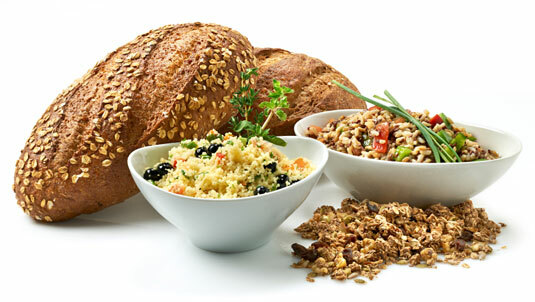 Whole grains (not refined grains) are important sources of fiber, selenium, potassium, and magnesium. Food manufacturers enrich grains to add back some of the lost B vitamins but not the fiber. The Mediterranean diet uses only whole grains like barley, brown rice, buckwheat, bulgur, millet, oatmeal, popcorn, whole-wheat bread, whole-wheat pasta, whole-wheat crackers, and wild rice. Enjoy fish or poultry rather than meat. Twice a week, substitute fish or poultry for meat. Yes, that means cutting out steaks, hamburgers, sausages, hot dogs, pork, and lamb. 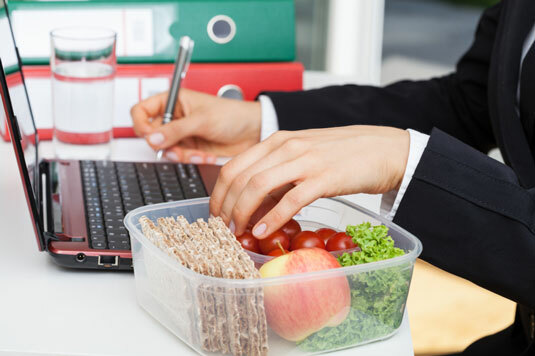 By doing this, you significantly reduce the saturated fat and cholesterol in your diet. But you don’t need to lose anything in the taste of your protein source. 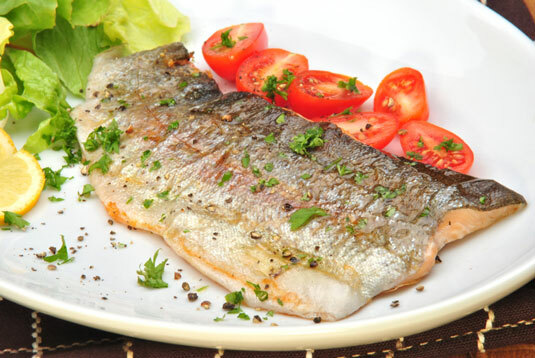 As for fish, you have numerous choices, including the following: salmon, tuna, squid, Atlantic mackerel, herring, sardines, bluefish, rainbow trout, sablefish, and Pacific oysters. What these fish have in common is that they’re high in omega-3 fatty acids, but so far supplements of omega-3 fatty acids haven’t been shown to have the same value. Switch to olive oil in place of animal fat or butter. Most of the countries that border the Mediterranean Sea, especially Spain, Italy, and Greece, grow enormous quantities of olives. When the olives are pressed, they produce olive oil. 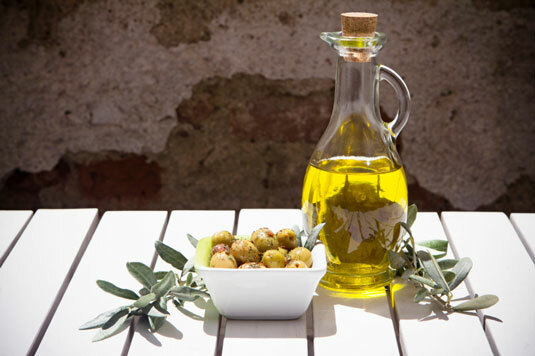 Olive oil has been eaten in the Mediterranean for more than 6,500 years. Though none of the citizens of those countries have lasted that long, men on the Greek island of Ikaria reach the age of 90 at two and a half times the rate that Americans do, and they live a decade longer free of any disease, including depression and dementia. Olive oil alone isn’t responsible for the increased longevity — the whole lifestyle accounts for that — but olive oil has numerous benefits. You can use olive oil in place of butter in just about any recipe. Cooking usually gets rid of the aromatic olive oil flavors. 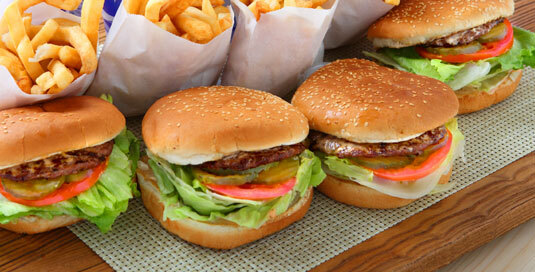 Avoid highly processed and fast foods. Highly processed and fast foods are loaded with fat and salt, and people who eat a lot of fast foods are heavier and less healthy than those who don’t. Consume vegetables throughout the day. You can’t eat too many vegetables. To eat a significant amount of calories through vegetables, you would have to eat so much that you wouldn’t be able to eat much of anything else. That’s not a bad thing. What makes you think that you can use broccoli only as a side dish with your meat or fish? How can you possibly get in your daily three to five servings of vegetables if you think like this? What would happen if you drank vegetable juice for breakfast? Suppose you added vegetables to an omelet? How about a salad at lunch instead of that large sandwich containing way too much carbohydrate? 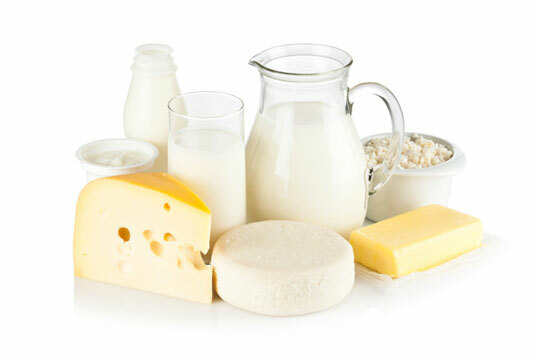 Avoid high-fat dairy products and added fat in recipes. Food manufacturers have tried to satisfy the demand for low-fat dairy products like cheeses, cream cheese, yogurt, and sour cream. In some cases, they’ve succeeded. You have to try them for yourself to know just how close they come to the high fat you’re used to, but the saving in kilocalories will be huge over time. Dairy is rich in calcium, potassium, and vitamin D, so it remains an important part of a complete Mediterranean diet, but unless you enjoy goat’s milk, it should be low-fat or even nonfat. 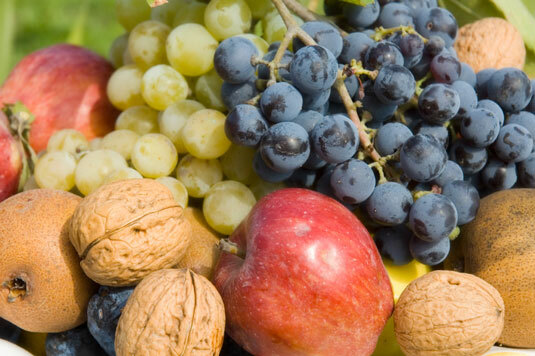 Snack on fruit or unsalted nuts. An apple, 4 apricots, a banana, 3/4 cup blueberries, 12 cherries, 15 grapes, an orange, 1 pear, 2 plums, 1-1/4 cups strawberries, 1-1/2 cups watermelon . . . all these represent just 60 kilocalories. Compare that to typical pieces of yellow cake with vanilla frosting (239 kilocalories), pound cake (116 kilocalories), or pineapple upside-down cake (367 kilocalories). Make it easy to eat a fruit and hard to eat cake or processed sweets. Keep bowls of fruit visible and in easy reach. Alternately, you can eat some nuts for a snack, but make sure they’re unsalted and don’t eat too many at a time. The following selections are about the same kilocalories as that piece of fruit: 6 almonds, 1 tablespoon cashews, 2 whole pecans, 10 large peanuts, 2 whole walnuts, or 2 teaspoons pumpkin seeds. This simple but profound change in your eating habits will reveal itself on the scale very rapidly. You’ll be eating almost two-thirds of a pound fewer calories per week — a three-pound weight loss each month in addition to all the other changes you’re making. Sip a little wine and a lot of water. 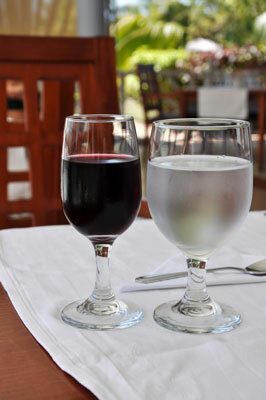 Wine, especially red wine, is a fixture of the Mediterranean diet. But like everything else, the people of the Mediterranean area drink it in moderation. That means two 5-ounce glasses for men and one for women with a maximum of ten per week. And it’s usually consumed with meals. Remember: Wine is better than beer or liquor for your health. Wine in moderation reduces bad cholesterol and increases good cholesterol. So when you raise a glass “to your health,” it may have some basis in fact. Water should be your main nonalcoholic beverage. And don’t waste your money on fancy bottled waters. Water is water. We’re blessed in the United States with clean, clear healthy water coming out of the tap. The old rule of eight 8-ounce glasses of water a day was not based on scientific evidence. You can drink less, but it should still be your main source of liquid. Legumes include beans, peas, and lentils. They have little fat and no cholesterol, and they provide folic acid, potassium, iron, magnesium, and several other nutrients. The fats they do contain are good for you, and legumes are loaded with fiber. Their high protein content makes them a very good substitute for meat, fish, or poultry. 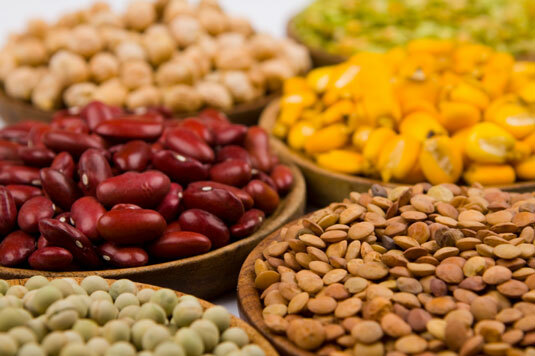 Legumes include black beans, black-eyed peas, chickpeas, edamame, fava beans, lentils, lima beans, kidney beans, and over 13,000 other varieties. They can be used in soups, salads, stews, as snacks, to make hummus (chickpeas), and anywhere you feel like throwing in a few legumes. Legumes make you feel full, a very definite benefit. If you combine legumes with whole grains, you’ll be getting all nine essential amino acids, the building blocks for protein in your body. Soybeans alone have all the essential amino acids. Like berries, legumes contain lots of antioxidants, healthful substances that protect the eyes, the skin, the immune system, and the brain.